Another busy week has flown by - busy in my day-job and busy at night making new products. The new hexagon-shaped charm packs that I previewed the other day are now listed in my store. I have decided to sell them for around the same as the Australian retail price of the regular square charm packs from Moda. Yes, that's right - a charm pack of pre-cut hexagons for the same price as the squares! (My local store sells the square ones for $17.95 and some eBay stores sell them for $15 so my hexagon ones are in between.) Ready for you to machine-sew or hand-sew without any further preparation. I couldn't resist using another pack myself. 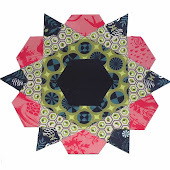 Here's my latest charm quilt, using A Walk in the Woods by Aneela Hoey for Moda. I need lots more practice at free-motion quilting! You might have noticed in my store that I often only have 2 or 3 packs available for each range of fabric hexagons at any one time. That doesn't mean that more aren't available, it just means I haven't made it for you yet! I'm not a store so I don't have a lot of stock sitting on the shelves. I generally just custom-make my products when anyone orders them. If something is 'out of stock', that just means that I will custom-make it for you, so please do not hesitate to email me your requests. If the fabric is available, I'll make it for you within 24 hours. I am determined that from the New Year on, I am going to spend a full day each weekend at my cutting table, making LOTS of stock so I can do LOTS of markets in 2012. I enjoyed getting out of Sydney so much in November to go to the Braidwood quilt event, so I want to do lots more of that. Do you have a favourite market? I'd love to hear about it, so how about we make that the theme of a new giveaway. This giveaway is to launch my new Hexagon Charm Packs. An Australian winner and an International winner will each receive a Hexagon Charm Pack of their choice. You can see what's available now here, but I will add more Moda ranges over the coming weeks. Plus, each winner can nominate a friend to receive a surprise present. Keep it a secret for now, don't mention any names in your comment, just let me know their details when you win and I will send them whichever Hexagon Charm Pack you think they'd like. To enter, leave a comment telling me about your favourite market, whether that's in Australia or overseas, a quilters market, flea market or whatever. I'll draw the winners on New Year's Day. Good luck! Those hexagon pack look like a great idea. My favourite market is our local one in Bethlehem Tauranga New Zealand. It one where you can get anything from avocados to new carpet to sweets and garage sale gear. 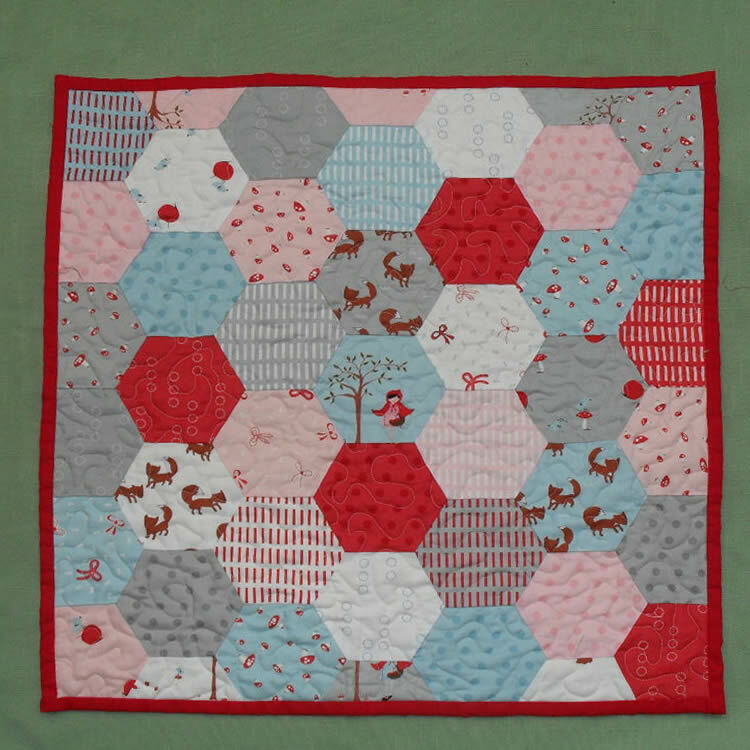 Your hexagon quilt is cute! I like the idea of precut hexagons. My favorite market is a quiltfest. It is held in Jacksonville, Florida. My favourite markets are the local Brisstyle Etsy markets - all the stallholders are Brisbane-based Etsy sellers. They're held quarterly plus a couple of extras (eg for Christmas). Great range, lovely people. Oh, would love to win these! So gorgeous. Thanks for the chance to win! I would so love a pack of these! On Saturday we went up to the sunshine coast to The Mummas Markets. I think all the stall holders are mums with young kids which is great, and most of the items for sale are for little kids - especially girls! A lot of gorgeous stuff here! Luckily for my wallet I only have boys LOL! There is occasionally a farmers market in our local town, one of the stalls make fabulous cakes and chocolate treats! The hexie packs look fantastic! Thanks for the chance to win! The christmas market in Fowey is very picturesque along the harbour, with all the lights reflected in the river. NOt much in the way of markets going on where I live so there isn't a lot to choose from. In the summer there is a market in the big city on Thursday afternoons, and if you get there early enough you can get some fresh locally grown produce which is wonderful...except I seldom get there early enough. They also have some fun things like stiltwalkers and bellydancers from time to time. I love all the farmers markets in the summer. Nothing like fresh produce! My favorite market is the French Market in Wheaton, Illinois -- every Saturday in the summer! I've only been to the national Craft and Quilt Fair that APQ or AQC (??) put on around Australia. Last year and this. LOVED it! Weird... NOW it comes up with my Google account?! My favourite is the farmers' market in Saltburn (UK) and the best stall is the one that sells fat rascals, yummy! There are also stalls of stained glass, jewellery, soap, yarn and willow as well as the usual meat, vegetables and wine stalls! Totnes Market (On a Friday)Devon, England-Full of crafty loveliness (silver, knitted, soaps) & furniture ready to be upcycled! I love to go to farmers markets in the UK when we are there on holiday :-)Thanks for the chance to win! There is a local craft market which i have been dying to get to and check out ( kingswood nsw), but keep missing the one day a month they are there!!! I have not been to a decent market in a long time!!! What a neat idea - love the hexagons. 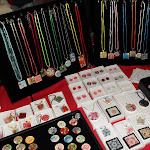 My favorite markets are the local craft shows that are so popular this time of year - really a source of inspiration. I rarely buy anything---just go for the ideas. Markets such as you mention are not common in my part of the US. Having one of those lovelies would help make a quick project without wasting fabric! I love all your charm packs! I would love to have A Walk In The Woods, it is way cute :) My favorite quilt market is the Pacific International Market here in the states in October...it's wonderful! I live in the Pacific Northwest in the States, where we have a lot of great markets, such as the one held on Saturdays in Portland, OR. But since we live out in the country, I tend to shop at etsy far more often--an online marketplace, but much "closer" to me. Thanks for the giveaway--the hexie charm packs are a great idea. Not too many markets around here . . . just the farmer's market, which is pretty great on its own though! Those hexies are lovely. I used to visit a fabrics store called Kamdar in my country. They have lots of fabrics collection but do not carry designer fabrics. Thanks for the chance to win. merry Christmas and Happy New Year! I just found your blog. These hexies are amazing. Will be coming to buy some soon. We do't have too many markets where I live. Just a small quilt and craft show once a year. I have to go to the nearest capital city to go to a big quilt show. What a great prize, Joanne! Love the quiolt you made and will definitely be into these. I like the Delray Affair in Florida, is a three day event with a lot of craft vendors and music and fun food. I live in France and I have two favourite markets, one at Piegut which is about 20 minutes away, this is held on a Wednesday morning and the other is at Brantome which is on a Friday morning and is about an hour from us. Both are best avoided during the tourist season!!! Great idea! This is the first time I've seen hexie charm packs. Here in Canada in the summer we have Farmers Markets. We can buy farm fresh vegetables, fruit, jams and lots of other seasonal goodies. Thanks for a chance in your giveaway. WE have lots here in Canberra but the best by far is the Hall Market which is the first sunday of the month. They have all sorts there...I am trying to work on some little easy stuff to sell at the market stalls at our annual fete in October. I am only new to the school so am hoping to get a few more market stalls happening there then that will be the best little market. There are no markets close to where I live, so I just live through everyone else in blogland. I love going to the local thrift store. My favorite market is in Dorset UK, Wimborne market has a wonderfl mixture including a few craft stalls which im drawn to lol. I love your hexagons. My favorite market is at the quilt show in Paducah, Kentucky every spring. I love the Sully Quilt Show in Virginia, held one day in September. There are quilt shop vendors, and lots of lovely old quilts to look at and buy. I love your hexagons. I can't wait to have a pack. I love the international crafts fair in Lisbon. My favorite part is the fabrics, of course! Those are awesome.I love Sitges quilt Show in Barcelona.It`s in March.There are many quilts and shops to have a look and buy something. I like the Malvern Quilt show held twice a year in the UK - great quilts and lots of yummy fabric! My favorite market here in the USA is in Hartville, Ohio. It's great for antique finds. Thanks for the chance to win the hexagons! Love the new hex packs. My favorite market is a flea market in Orange County Florida. They have something for everybody. Great giveaway! I love both the Red Hill and the Mornington markets in Victoria! Great variety of produce and craft! I'm afraid I don't get many opportunites to get to markets but when I can I love the array of fresh fruit and vege. I love to visit the Victoria Market. It has so much variety of food and goodies and also the best donuts on the planet! The hexagon charm packs are definitely a fantastic idea. What a fabulous idea and giveaway. i dont do too many markets but the one I enjoyed the most last year was the "Gerringong markets", in fact we are planning a dat out there next month. We have a nice "world market" near Cleveland Ohio. We can get watermelon at odd times of the year. I love to go there and look at all the veggies and exotic fruits and try new thing$. My favourite market is in my neighbourhood is at Cobbity. Held in the Public school first Saturday of each month March to December 8am-1pm. Stall holders travel from the Northern beaches and the Blue Mountains just to have a stall each month. These markets nearly died an untimely death about 6 years ago when a article in the local paper encouraged locals to join the markets committee, we have a good friend and a cousin who both put up their hands to join. I hate to miss a month but December was crazy at 9am the carpark was full and so was the street so can't wait for early March for my next fix of my favourite market. We have a few crafty markets here in melbourne. I was hoping to get to one before christmas, but it got cancelled because of the rain and wet weather we had. Love the idea that you have cut them already, making a list of things to do this year looks like these will on that list. Love the hexie packs. Eltham is a good craft market but I did enjoy one my son took me to in Canberra but I can't remember the name. Sadly won't be visiting Canberra for a long time. I don't get the chance to go to as many markets lately but one I do try to get to is the Vic Market in Melbourne,lots of variety.Love your big hexagons,great idea :) Barb. 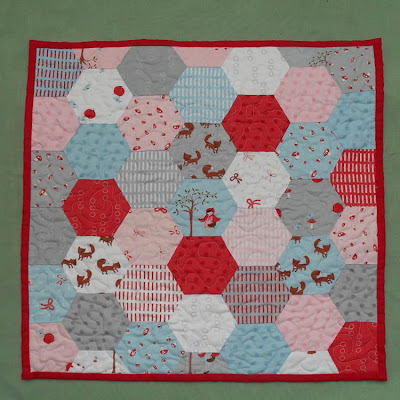 Gorgeous hexies! And so nice of you to take some of the work away from others by pre-cutting them! I used to love discovering French markets when we went on holiday there. So much variety and everything so fresh and local. At the moment I suppose my favourite market would be the Kalamunda Village Markets.. they run on the first Saturday of each month, and my MIL and I have a stall selling her gorgeous handmade natural olive oil soap. I love being able to wander around and look at all the crafty things people have made, and the yummy food on offer. It's my one day during the month when I am not a "mummy"! The Handmade Market(Heritage Craft Fair) at St Ives in Sydney has a fantastic variety of...well...everything. It's been around practically for ever - I used to go more often when I lived over that way. Those hexagons are so yummy and good luck with your market ventures in 2012! The monthly Showground Markets in Kempsey are my favourite as they have the most variety, with fruit/veg, soaps, cards, sewn crafts, clothing, even ducks and hens etc but it seems to attract the rain! Lol, first Saturdays of the month seem to be popular market days :). Your site has given me a whole new interect in English paper piecing. Is there a way to get updates for your blog? New Products - Notice something different?